An adult Bald Eagle carries greenery to the nest. Photo © Scott Kelly. The American Eagle Foundation understands the importance of raising a new generation that will appreciate the unsurpassed beauty of our planet and the creatures with whom we share it. One of the most majestic creatures on the planet is the Bald Eagle. 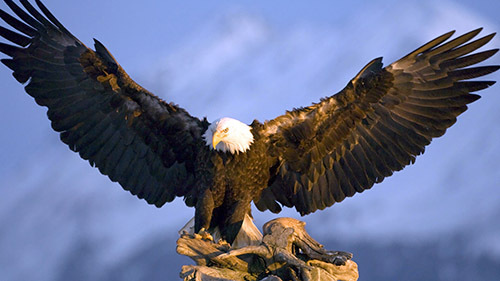 The symbol of our country, it once again flies free and strong over the skies of America, and our Eagle Cams allow hundreds of thousands of people to watch the everyday life of an eagle family raising their young; keeping their nest home secure and strong; bringing food to their babies, and gently giving them their first tiny bites of nourishment. Our viewers can watch the eaglets grow strong and fly free—and that is the greatest inspiration we can think of! On our Chat Forum—found on all our cam pages—skilled moderators guide a discussion to educate and inspire all those watching. In addition, we provide private question and answer sessions that are set up for classrooms with students from all ages, from kindergarten through high school. The positive responses we have received from the “chatters” who participate; the glowing reports from teachers about how engaged the students are while participating, fully demonstrate the effectiveness of our moderated cam program. Every time we conduct a Birds of Prey show at a school or park, every time we visit a Veteran’s Hospital with an eagle on our glove, or allow Challenger to soar above a packed stadium or other venue as our National Anthem is being performed, audience members are touched and moved by the beauty of these creatures. We challenge students, clubs, civic organizations, and individuals to advocate for the Bald Eagle by participating in American Eagle Day on June 20th of each year, providing downloadable packets to help them channel their energies and creativity in the most efficient way. Mr. Steinbrenner’s sentiment has been echoed by millions of others who have been fortunate to see the “Bald Eagle Poster Eagle” fly – in person or on our YouTube videos, which have gone viral. Yes, we inspire, and we will continue to do all we can in the future to lift up, challenge, and educate millions more about our mission, the importance of conservation, and what each of us can do to leave our planet and its creatures in a better, safer place for the generations who come after us. The American Eagle Foundation is grateful to receive testimonials from individuals and classroom teachers who have been inspired by watching our live streaming HD Eagle Cams online, by those who have seen Bald Eagle Challenger fly free into stadiums, and by others who have attended our Wings of America birds of prey show at Dollywood. Watching a wild family of eagles in the AEF-sponsored NE Florida nest has brought nature into the homes of hundreds of thousands of people. In 2016, AEF placed high definition video cams in the nest tree of a pair of Bald Eagles at the National Arboretum in Washington, DC. 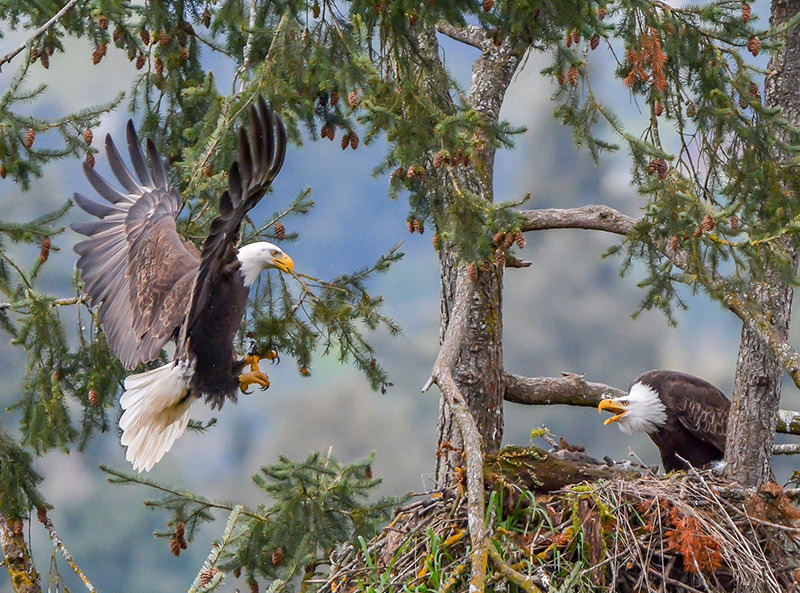 Millions of people watched this pair successfully raise 2 young eaglets. A deeper appreciation for the Bald Eagle and for their environment is what we hope will be the end result of the experience. Nearly everyone who watches comes away with a feeling of awe as they witness a newly-hatched eaglet grow into a proud strong eaglet, ready to stretch its wings and fly free. A slightly different experience and appreciation is gained from watching our captive, non-releasable Bald Eagle pairs at Dollywood raise their young. Although disabled and unable to ever fly free again, these valiant eagles have raised almost 150 babies that the American Eagle Foundation has released into the wild, soaring from AEF’s artificial nesting tower into the foothills of the Smoky Mountains. “I just wanted to drop you all a line and thank you for the joy that my mother and I have found by visiting your eagles nest. I started watching eagles last year and found Romeo and Juliet’s nest. My mother does not have a computer so I would do videos for her and also take pictures of the nest and the process from eggs being laid to hatching, branching and fledging. My mother will be 101 on April 13, which is also Challenger’s birthday, which thrills her. This web site has given us so much, words cannot say. It has given us things to discuss and talk about. It has given her something to look forward to when I go over to see her. By the way she is still living in her own home with help from caregivers and myself. We have both learned so much from the NEFL site and the wonderful mods and chatters at that site. She also loves watching Challenger when he makes his appearances at different events. She is just amazed at how he does what he does and it puts a smile on her face and mine. I became a member this year and was thrilled to do so. Your work is so greatly appreciated and needed and God bless you for all that you do.